Born: 1860, Smyrna (now Izmir), Turkey. R. Lewis Cousens (sometimes spelled Cousins), son of Reverend R.R. Cousens of the Isle of Wight, was educated at St Olave's Grammar School, London, and later became a member of the (British) Institution of Electrical Engineers. He came to the Cape Colony for the South African Brush Electric Light and Power Company in 1882 and settled in Kimberley. Two years later he was appointed by the Town Council as borough electrical engineer, a post he held to 1889. The next year he moved to Johannesburg as representative of the firm of electrical engineers Woodhouse & Rawson, for whom he worked until 1895 when he set up his own practice as a consulting electrical engineer. In 1892 he joined the South African Association of Engineers and Architects in Johannesburg as a foundation member and on 31 August that year addressed members during the discussion of the very first paper read before it, by J.H. Davies*, on the electrical transmission of power. Cousens advocated the construction of electricity generating stations at individual mines, and argued that electricity was much more convenient and economical than compressed air for driving underground drills. During 1894-1895 he was negotiating a contract with the government of the South African Republic (Transvaal) to transfer electric power from the Vaal River to the Witwatersrand. In 1902 he drew up plans of the proposed Paarl Tramway, to be built by the Paarl Electric Power Syndicate, Ltd.
Cousens was a member of the Geological Society of South Africa, serving on its council in 1897. During that year he participated in a discussion of a paper by G.D. Stonestreet* on the Black Reef. Acknowledging that he was not a professional geologist, he indicated that he had been closely connected with mining operations at various places on the Black Reef and proceeded to deliver informed and detailed criticisms of several of Stonestreet's observations and conclusions. Cousens became a member of the British Association for the Advancement of Science when it visited South Africa in 1905 for joint meetings with its South African counterpart. He delivered a paper at one of these meetings, in Johannesburg on 30 August 1905, on "A radio-active substance discovered in the Transvaal". The paper, which was based on his own work, was included in the Addresses and papers ... (Vol. 1, pp. 158-174) published after the meetings. Cousens found that a heavy mineral concentrate he had obtained from an alluvial deposit which he traced back to a volcanic pipe in the Waterberg sandstones, was radio-active. The concentrate contained mainly zircon, rutile, ilmenite and magnetite. He conducted a series of physical and chemical experiments in the laboratories of the Transvaal Technical Institute in Johannesburg, proving that rays from the material could fog a photographic plate, were absorbed by metal, and could discharge an electroscope. The radio-activity increased when the minerals were crushed and was tentatively attributed to the presence of radium or its decay products. By 1911 he appears to have become a prospector, and in 1914 was still prospecting on various farms in the Transvaal. 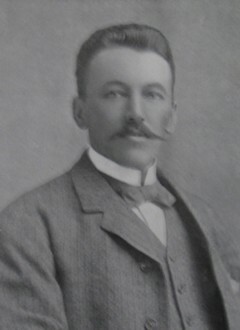 Cousens was greatly interested in all sports and was for many years captain of the Kimberley Rugby Football Club and the Wanderers Rugby Football Club, and by 1905 was vice-president of the Transvaal Rugby Football Union. Addresses and papers read at the joint meeting of the British and South African Associations for the Advancement of Science held in South Africa, 1905 (Vol. 1). Johannesburg: SAAAS, 1906. Geological Society of South Africa. Transactions, 1897, Vol. 2, pp. 1-2 (office bearers); pp. 84-86 (Cousens comments on Stonestreet's paper); pp. 159-164 (list of members). National Automated Archival Information Retrieval System (NAAIRS). http://www.national.archives.gov.za/naairs.htm Documents relating to Richard Lewis Cousens / R. Lewis Cousens / R.L. Cousens. South African Association of Engineers and Architects. Proceedings, 1892-1898, Vol. 1 and 4: Lists of members.